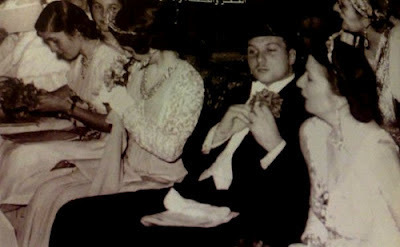 When King Farouk married Safinaz Zulficar and made her his Queen Farida, there were some major celebrations, and of course major BLING (AKA jewelry). In the Egyptian tradition, the groom doesn't give the bride an engagement ring, but an engagement set or parure called "Shabka" (Although now as jewelry prices are going higher more girls are opting for the western diamond ring). 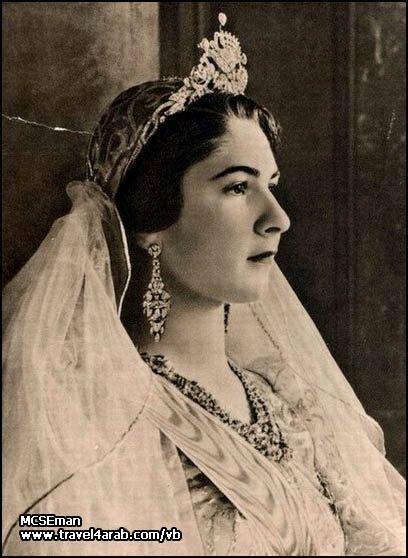 But the king's gift to Farida wasn't exactly a parure, and the pieces she wore on her wedding days(s) weren't the only pieces she received. 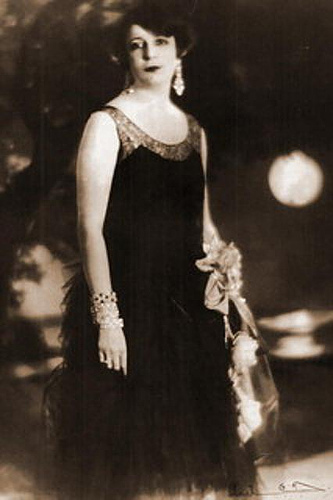 The new queen received a tiara with peacock and Lotus flowers motifs which is said to have been one of Queen Nazli's (the queen mother) tiaras (Nazli had a huge collection and it's said that the tiara was a gift from her to Farida). 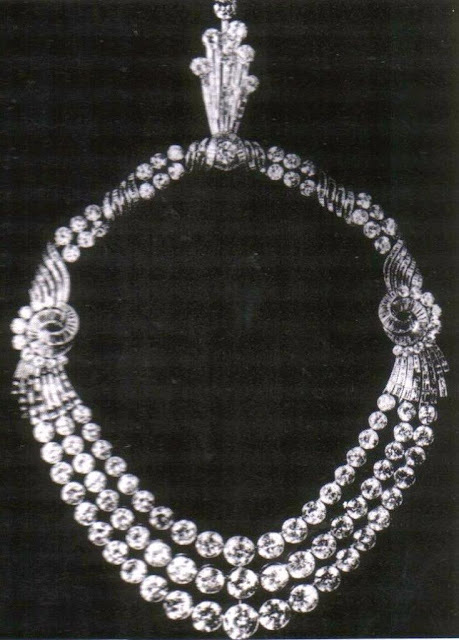 The King also gifted her an amazing Boucheron necklace that was bought in Paris prior to the wedding, the masterpiece that was made of 114 diamonds and weighed 346 carats was created for the Universal Exhibition of 1937 and was the most admirable piece there, King Farouk bought the necklace for 2,800,000 francs (read that it was about 27000 pounds but not sure if the number is accurate). This necklace was a favorite of the queen and she would wear it over the years until the divorce. Farida also wore earrings that we don't know whether they were newly purchased or passed down from Queen Nazli's jewelry stash. 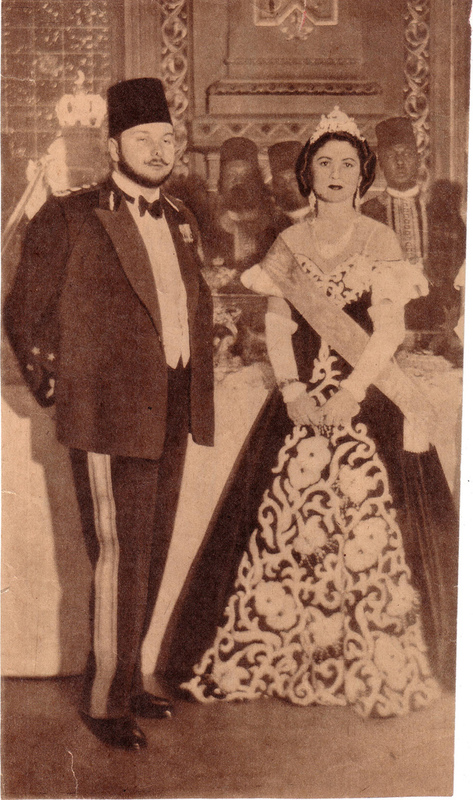 The couple got divorced in 1948, Which caused much anger all over Egypt as the public considered Farida one of them and the link between them and their sovereign. people went on protests with slogans of how Farida is too good and pure to be married into such a family! and the next queen(Narriman) didn't wear any of Farida's jewelry although we have a story that the king ordered Farida to give him back all the jewelry he had given her even those that were gifts (The same story mentiones that Farida told him that her tiara had a missing diamond but she would pay for a new diamond herself, still not sure if that's true or not and which tiara did she mean). 4 years after the divorce the 23rd of July revolution happened and the king left Egypt and left the jewelry behind him. (not all of them as you'll know in the coming posts). So What happened to the jewelry?! The answer is no one knows! the earrings might be in The Royal Jewels Museum in Alexandria as There's a video from British Pathé that was shot in 1954(December) it's said that it was prior to an auction, but somehow most of the jewellery in the video are now in the museum, I visited the museum myself but I didn't notice the earrings probably because I wasn't looking for them, however even if they're not on show in the museum that doesn't mean they're lost as most of the Royal jewels are not on show, but instead are kept in giant boxes in the Central Bank's safe and The Egyptian Museum's storehouse. 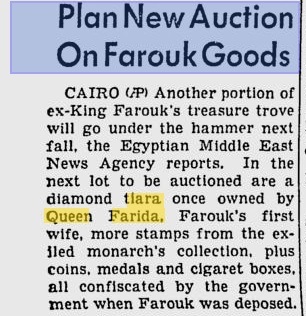 And while the tiara hasn't been seen ever since the divorce, On March the 29th 1957 many news papers published that an auction would take place in Cairo and a diamond tiara that belonged to Queen Farida would be in the auction along with some rare stamps and other royal properties. Was it this tiara? Was it sold in the auction or not? still a mystery. Also the necklace hasn't been seen but there were rumors that the daughter of one of the Free Officers (The movement of officers that made the coup/revolution) picked that necklace to wear in her own wedding, We have no pictures of this wedding -since it was a private affair- to tell if the story is true or not, and if it was true we don't know if she ever returned it or not... whose daughter was this? Salah Sallem, but again it's just an unconfirmed rumor. 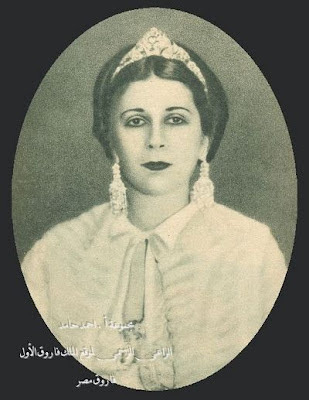 Will we ever find out what happened to Queen Farida's jewelry and actually see them? Yes, As there's a project to restore The Baron Empain Palace in Heliopolis and turn it into another royal jewelry museum (we don't know if the project still exists or not) also we might get some investigations, or maybe a reporter will be lucky enough to browse the HUGE collection kept in storehouses, But it's unlikely for these jewelry to be seen worn, I believe the time of seeing them worn has gone, we might see them in museums or exhibits but not on a woman, and for sure not on an Egyptian princess/queen. In April 1950, Life magazine published this photo of Queen Farida, King Farouk, and Queen Nazli and wrote under it that it was taken on his wedding day, And as we know Life is never wrong so we can guess that this was one of the wedding balls in 1938 (Yes they had several galas and balls). 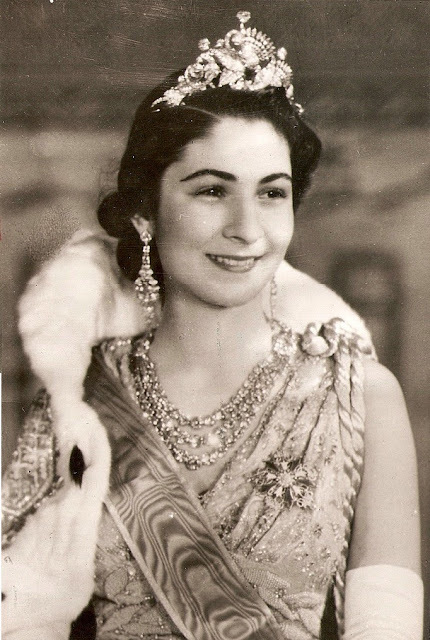 Queen Farida seems to be wearing the same earrings along with her Boucheron necklace and ANOTHER TIARA, looking at the video from British Pathé we can see the same tiara but this time as a necklace! And So now we know that her majesty The Queen had a convertible piece of jewellery!! 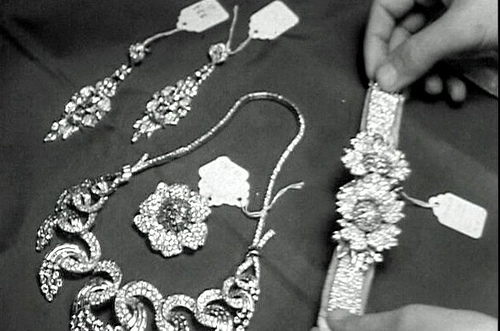 However Farida didn't seem to love this tiara/necklace much, we have few pictures of it as a tiara but never as a necklace..
Farida was wearing a lace(?) long-sleeved gown probably by The House of Worth or the French couturier Molyneux. 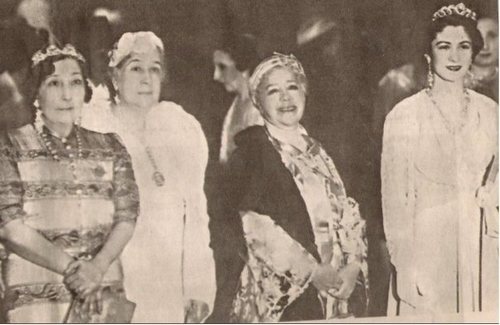 Priness Chevikar, Princess Nimetalla Mokhtar, Sultana Melek and Queen farida. 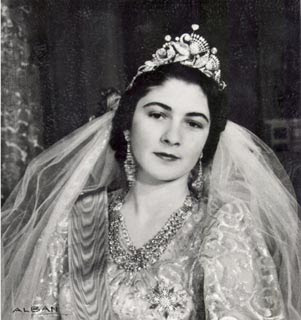 Queen Farida wearing the tiara several years after the wedding for her birthday photo session (With the Boucheron Necklace). 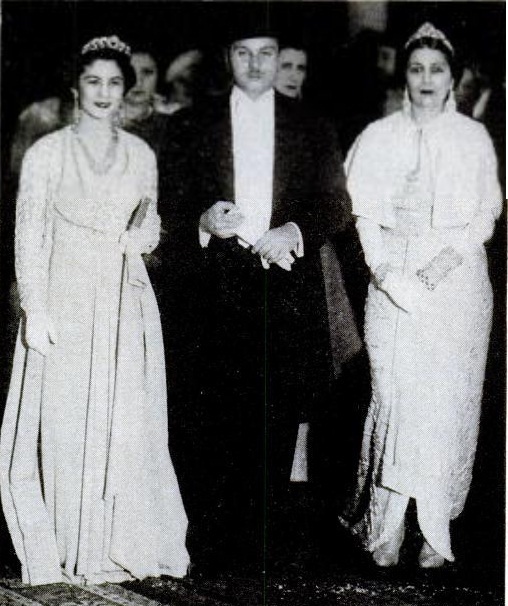 But we are sure that Queen Nazli is wearing Chanel as we know that Chanel had the honor of creating all of the Queen's gowns for the wedding as well as the young princesses' gowns (That means in case you didn't notice that the dress worn by Princess fawzia below was designed by Chanel). 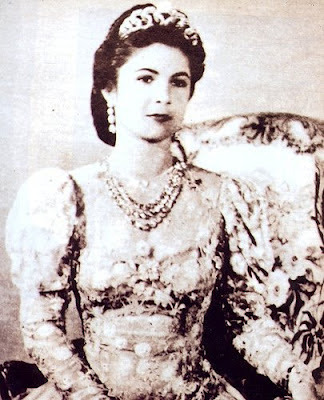 I think the Peacock tiara is unique, And the fact that it's made of diamonds only makes it versatile and easier in matching with clothes and sashes, but if it really had an emerald which is unlikely it would make it harder to match, I also think Queen Farida had the personality to pull it off, What do you think about it? 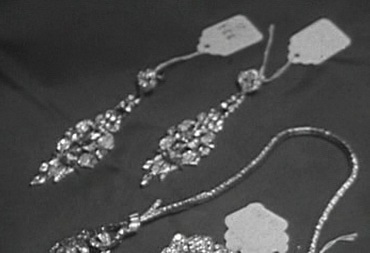 im 100% sure that these crystal wedding jewelry sets are worth millions of pounds! no question these are all elegant and lovely!and these are heavy karats!thanks for the post! Women's are obsessive about Jewellery because it represents femininity and even social status. Women feel beautiful and confident once they are loaded with jewellery. The jewelery design is so superb..especially the nickles and earnings...this kind of jewelery design is now stop manufacturing noways..
Beautiful jewelery design . I like all jewelery designs looking very traditional. Great post! See amazing wedding jewelry here and the design is super and thanks for your sharing. Keep it up your excellent work. WOW!! These jewelry is beautiful. I was searching for some beautiful earring which should be worn on an engagement ceremony as I had an engagement, I came across a versatile link for this and I got highly impressed by looking at the stuff. I ordered my engagement earring. Queen Farida's Peacock crown was wonderful. It has a great heritage, respect, tradition and authenticity. Thanks for the share!! Hi: love your fairy Wedding Jewelry I'd love a tutorial on Elven Star I even have been wanting a tutorial thereon vogue ever since I even have seen it. I will create the wire half simply do not know a way to do the remainder lol.These are very terribly attractive and wonderful items of jewelry. i prefer all the sets and decorations. anyone will appearance thus stunning with these jewelry. 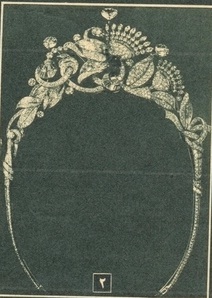 I loved the peacock tiara. I never knew about this tradition. Loved reading it. Thanks a ton for sharing. Superb designs of tiaras and chandelier earrings. The bejeweled crowns look fabulous on these queens. My friend asked me to search for something exclusive she can wear in her wedding and I found these breathtaking precious stone jewels. She loved this heritage look. In the old times royalty had such a great taste. I would like to see better image of the diamond ring.